Applications are invited from ICT (Information and Communications Technology) graduates for Prime Minister ICT internship Program 2019. It is actually a collaborative internship programme between Pakistan Software Export Board (PSEB) and National ICT R&D Fund Company under the umbrella of Prime Minister’s National ICT Internship Program a sectional from the National Youth Programmes. Through this program, PSEB will deploy 3,000 ICT graduates who have graduated in 2019 or later in ICT companies and IT departments of public & private sector organizations for a period of six months. 30% seats have been reserved for female ICT graduates. 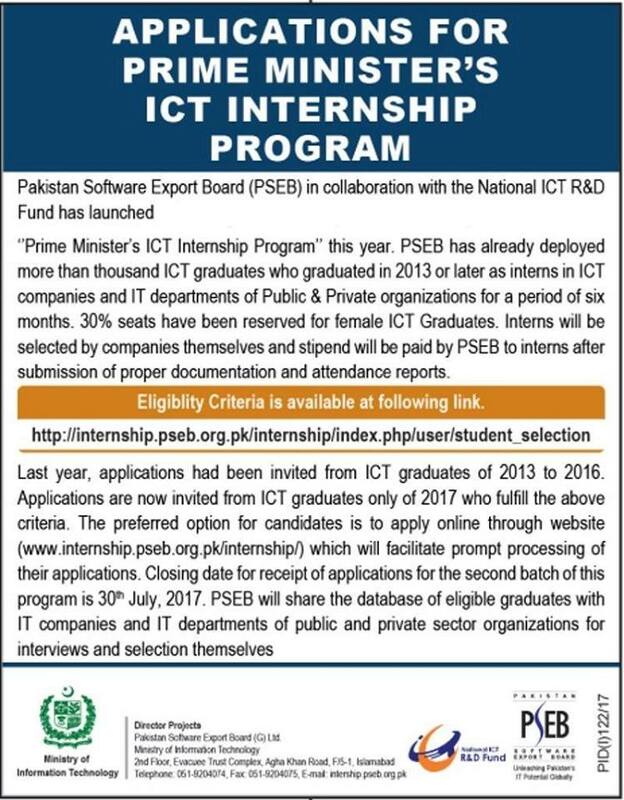 Interns will be selected by companies themselves and stipend will be paid by PSEB to interns. Bachelors degree in ICT discipline BCS, BE (Computer Information System), BE (Electronics), BS (Computer System Engineering) MBA (IT), MBA (MIS), MS (Information Security) & other equivalent. The candidate they fulfill the criteria they must submit the application for this program. It is golden opportunity for those students who are waiting these programs. Also below you can see the complete information of this post. Duration of internship is six month and Rs 15,000 per month upon submission of monthly progress and attendance reports to PSEB. Candidates having 16-18 years of education from the recognized universities/institutions. Applications are invited from the ICT graduates of 2019 or later fulfilling the above criteria. The preferred option for candidates is to apply online through website. Which will facilitate prompt processing of their applications. However, candidates having no computer access at all can apply through hard copy by postal mail. Closing date for receipt of applications for the first batch of this program is 30th December, 2019. PSEB will share the database of all eligible graduates with software houses, call centers, telcos, hospitals, banks and IT departments of public and private sector organizations for interviews and selection. Placement of first batch of interns is expected by January, 2019. Last date to apply for Prime Minister’s National ICT Internship Program is 30th July,2019. For getting more updates regarding the selection list of interns keep in touch with us. Students of final semester are eligible for this internship program? Can they apply for this??? Plz guide me in this case. i completed my graduation in july 2016 . i belongs to a very poor family ,my parents both has died and i have no satisfactory source of income , therefore i am applying for your national ICT internship program .